Green tea has been used traditionally in China for thousands of years for its health-preserving and revitalizing power. Modern science has identified powerful antioxidants in green tea called polyphenols. One group of polyphenols, called catechins, is particularly potent and is highly effective at neutralizing free radicals at the cellular level. Tegreen 97 is a proprietary, decaffeinated green tea extract standardized to 97 percent polyphenols — two-thirds of which are catechins, the element responsible for the observed effect. Each capsule of Tegreen 97(R) contains the same amount of catechins as seven cups of the traditionally brewed green tea drink and is 99.5 percent caffeine free. Tegreen 97® comes from green tea grown in Zhejiang, the number one tea-producing region, producing some of the highest quality tea in the world. Tegreen 97 was developed with the Pharmanex® 6S Quality Process, guaranteeing that proprietary technology was used in the manufacturing processes to maintain tight quality controls through all stages of development. The American Heart Association invited Nu Skin® to present research findings that Tegreen 97 provides blood sugar control, body fat burning properties and weight-loss benefits. The American Academy of Dermatologists invited Nu Skin and Stanford University scientists to present the findings of a two-year study showing how extended use of Tegreen 97 reduces the signs of sun-damaged skin. • Supports the antioxidant defense system in the presence of pollution, stress and toxins. • Helps support and maintain normal, healthy DNA cell structures. • Increases fat burning and decreases body-fat percentage. • Lowers body weight associated with inhibited angiogenesis. • Reduces signs of sun damage after six months of use. • Reduces dilated blood vessels on the skin’s surface after 12 months of use. • Reduces fine lines and wrinkles in the face after 24 months of use. Any adult concerned about long-term cell health and their antioxidant status should take Tegreen 97®. Individuals with a hectic, busy, or stressful lifestyle, or those frequently exposed to pollution might also find benefits from Tegreen 97® supplementation. Each 250 mg capsule of Tegreen 97® (Bold) is a 20:1 extract of green tea leaves, standardized to contain a minimum of 97% pure polyphenols, 65% of which are the catechins (> 95 mg EGCg per capsule). Tegreen 97® is considered decaffeinated for labeling purposes. 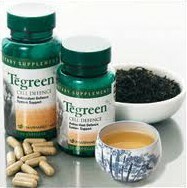 Tegreen 97® contains approximately 1.5 to 2 mg of caffeine per capsule, which is well below the stimulatory level. For comparison, a cup of coffee contains 100 to 150 mg of caffeine. Tegreen 97® is safe at recommended dosages. Safety data indicates it is safe for consumers to take up to two capsules twice daily for up to three months for increased health benefits with no evidence of long-term or short-term toxicity of green tea extracts. Pharmanex has been involved in multiple clinical studies in Asia evaluating the impact of Tegreen 97® on health parameters. The majority of these studies used a dosage of 600 mg of Tegreen 97® per day (200 mg green tea extract, taken three times daily). These studies showed benefits at this higher dosage without side effects. In addition, evidence derived from epidemiological data indicate that long-term consumption of 10 or more cups of green tea per day does not result in adverse effects and may be associated with significant health benefits. Is there anyone who should not use this product? Keep out of reach of children. If you are pregnant or nursing, or taking a prescription medication, consult a physician before using this product.